There are many reasons why pension fund managers, private investors and even governments are beginning to add bullion to their portfolios. 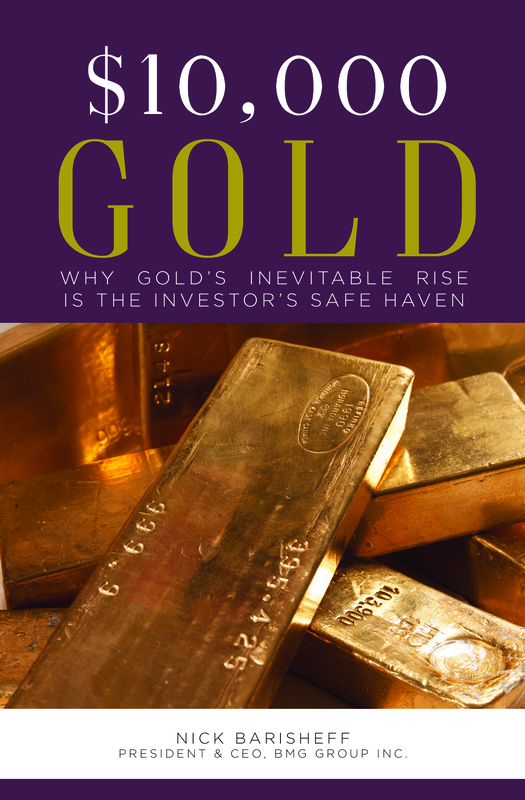 Perhaps the most important reason for this shift is that bullion provides superior insurance in times of financial uncertainty such as we are facing today. Until governments solve their debt problems and no longer need to debase their currencies through unbridled money creation, a fully diversified portfolio should include gold, silver andplatinum both for wealth protection and growth. Portfolios consisting of a mix of stocks, bonds and cash are not protected or fully diversified as correlations between these three asset classes have been increasing since 1969. Fortunately, as these three traditional classes become more correlated, one asset class, precious metals, grows more negatively correlated. When bonds, stocks and cash fall in value, precious metalsbullion tends to rise and vice versa. Therefore, a modern portfolio will gain protection as well as growth from an allocation of at least 5-15 percent to precious metals. 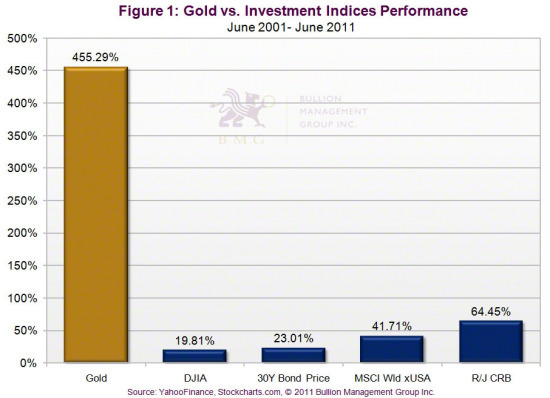 Figure 1 shows how gold has outperformed all major asset classes during the past decade. Gold provides wealth protection because it maintains its purchasing power better than paper currencies. Research shows that throughout history, every paper currency ever printed has eventually lost purchasing power against gold. 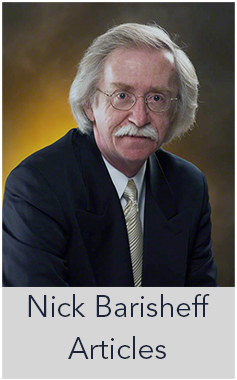 No fiat currency detached from gold has succeeded as a stable store of value, and yet no gold backed currency has ever failed. At present the world’s major currencies are headed along a well-trodden path to loss of purchasing power. 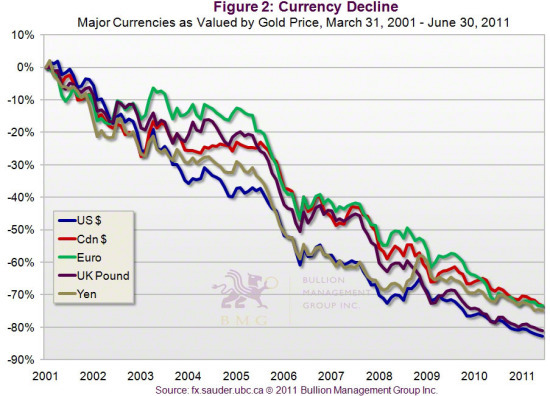 As we see inFigure 2, the Japanese yen, the British pound, the euro and the US andCanadian dollars have lost over 70 percent of their purchasing power against gold in the past 10 years alone. Figure 3 takes a longer view. It shows how the same currencies, including the venerable Swiss franc, have performed against gold since President Nixon removed the US dollar, the world’s reserve currency, from its final international peg with gold. This loss of purchasing power is the direct consequence of an unprecedented 40-year economic experiment during which none of the world’s major currencies was pegged to gold. Currencies lose purchasing power against gold for one simple reason: Currency supplies are expanding faster than gold supplies. Bullion is the one form of money governments cannot artificially multiply. 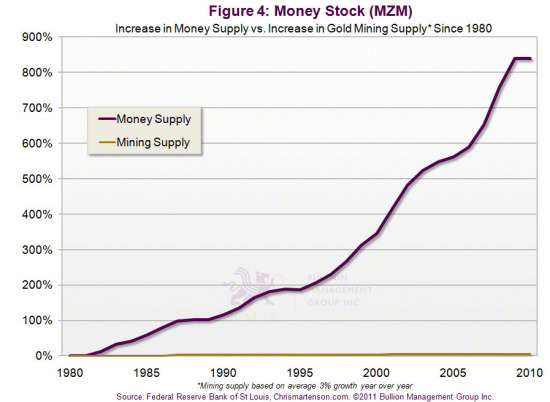 Since 1980, above-ground gold bullion supplies have risen, on average, about 3 percent per year.Figure 4 shows a comparison with the much more rapid rate of currency creation provided by MZM, one of the most reliable indicators of money supply. Like a spinning top must continue spinning or fall, our modern economic system depends on perpetual growth. This is one of the most fundamental features of the debt-based fiat currency system. The greatest threat to its health is slowing growth or deflation. The threat of deflation requires central banks to create vast amounts of money to compensate for lack of natural growth. This in turn creates inflation, as the root cause of inflation is currency debasement. Since there is no historical precedent for the worldwide levels of debt we currently face, it is impossible to predict when this cycle will end. 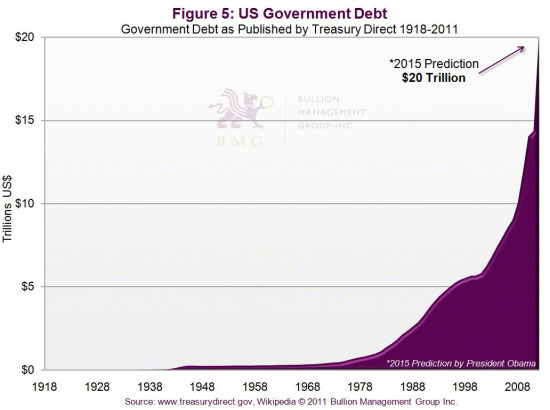 In fact, as we can see by the US debt chart (Figure 5), debt levels are growing exponentially. In this sort of situation, it is difficult to predict the outcome. 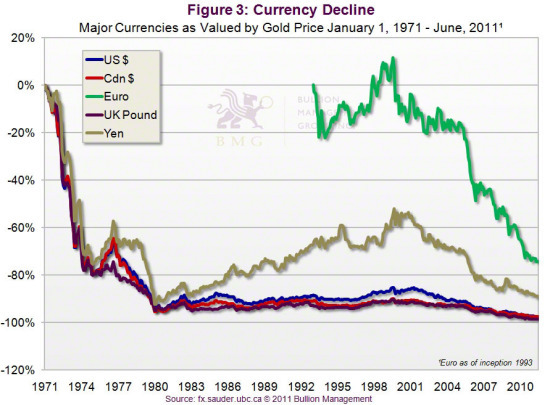 In truth, gold is not rising in value; currencies are losing purchasing power against gold. It is an inverse relationship and this implies the price of gold can rise as far as currencies can fall. In his insightful book, Hard Money: Taking Gold to a Higher Investment Level, pension fund manager Shayne McGuire makes an interesting point about this historic pattern Although there are only 30 recorded cases of hyperinflation (where goods rise at least 50 percent per month), all were caused by currency debasement to compensate for slowing growth. This debasement (a word derived from the Roman practice of hollowing out gold coins and filling them with base metals) is happening worldwide. Currency printing is the only tool central banks have to fight the deflationary consequences of outsourcing, high unemployment, an aging population, endless war and the interest payments on the debt they are creating. Hyperinflation is therefore a very real possibility. If this were to happen, how much will an ounce of gold cost when a wheelbarrow of dollars is required to buy a loaf of bread? Gold is money that banks and governments cannot expand. Precious metals bullion is one of the only forms of money that can exist outside of the world’s banking system and beyond the control of bankers and politicians. Buying gold is therefore portfolio insurance against the failure of the policies and practices of banks and governments. Buying gold provides an opportunity for individuals to regain a sense of control or sovereignty over their financial lives.Gold owned outright is one of the few assets that does not rely on an issuer’s promise to pay. This applies only to gold bullion or gold coins purchased and held in allocated storage or at home. Gold stocks, ETF shares, even bank certificates are paper proxies for real ownershipand will likely be difficult to redeem in kind at the time of financial crisis—the time we will need our gold the most. 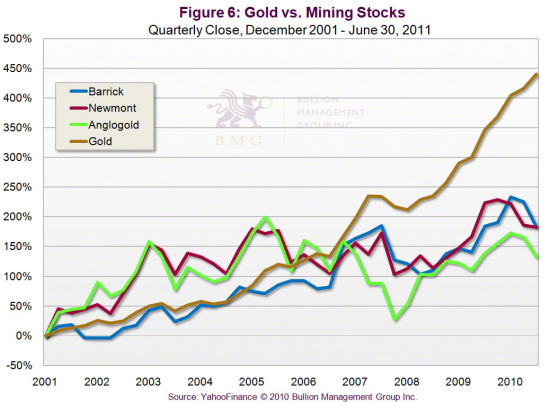 Gold bullion is significantly less volatile than gold stocks. Even the best gold stocks sell off in a stock market decline, as we saw in the fall of 1987 and the fall of 2008. Even when gold is discovered, there are many new hurdles to overcome on the road to production. Environmental restrictions, the threat of nationalization, heavy taxation andexorbitant infrastructure costs are but a few. South Africa led the world in gold production for years. In 1970 South Africa produced 1,000 tonnes of gold, yet only produced 200 tonnes in 2010. As we see in Figure 7 this is a global problem. Because of rising energy costs, the largest component of mining expenses, new Standard Chartered estimates that, to be economically feasible, new “greenfield” projects will require $2,000-per-ounce gold, and existing projects will require $1,400-per-ounce gold. At the end of 2010, according to the Standard Chartered report, the world had only 19.2 years of gold production left at the current rate of production. After nearly two decades of selling, central bankers are re-allocating to gold to protect against further loss of currency purchasing power. In 2009, they began to reverse this generational trend by becoming net buyers of gold. 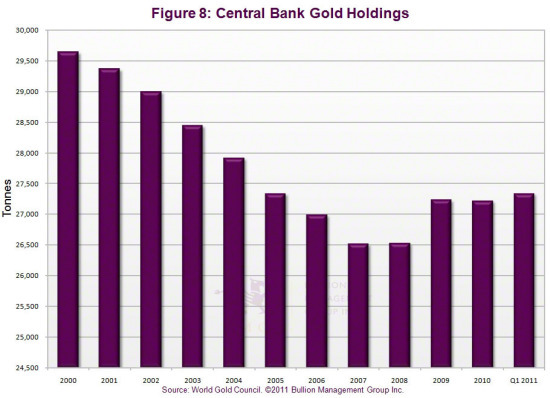 Central banks will continue to be the largest buyers ofgold over the coming decades. In Figure 8, the 2010 figure does not include the 454 tonnes that China admitted to buying secretly over the previous six years. Most of the emerging economies, whose central banks are the most aggressive buyers, have a very low percentage of their reserves in gold, and a much smaller ratio than first-world central banks. To reach parity, they will need to add thousands of tonnes to their reserves. The Chinese central bank for example, which has only 1.6 percent of its reserves in gold, plans to raise its reserves from around 1,100 tonnes, where they stand today, to 6,000 tonnes. This represents over two years of global production. Unofficially, they have stated a goal of 10,000 tonnes. Of course, there will be significant competition from the newly affluent developing world’s investing public who wish to protect family wealth. During the gold mania of 1979-1980, the Chinese public were not allowed to participate. Today their government encourages them to put 5 percent of their savings (and China has one of the highest savings rates in the world) intogold bullion. The Chinese public, like many of the principal buyers of gold bullion, remember the destruction a currency crisis can cause, as they experienced over 4,000 percent inflation per month between 1947 and 1949. They will increase their buying as they see currencies continue to lose purchasing power. In 2010, Chinese and Indian buying alone accounted for nearly 60 percent of annual global gold production from mines. Central banks and the public will have competition from pension funds, sovereign wealth funds, insurance funds, mutual funds, hedge funds, private equity funds and private wealth funds—which have, collectively, over $100 trillion in assets under management (“AUM”). Pension funds with AUM of approximately $24 trillion currently have about 0.15 percent of their assets allocated to gold bullion. In other words, they have not even begun to move intogold. Fund portfolio managers have avoided gold over the past two decades, as it pays no interest or dividends. Yet funds invested in stocks and bonds have lost an average of 24 percent of their value over the past decade. Had they owned gold during this time, these losses would have been mitigated or erased. The large funds, the real movers of the financial markets, are beginning to acknowledge the need to hold gold in their portfolios. If they allocated only 5 percent of their AUM to gold, it would trade at between $5,000 and $10,000 per ounce. As currencies continue to lose purchasing power worldwide, and more people come to understand the difference between bullion ownership and proxy gold ownership, the competition for the world’s available gold bullion will be fierce. 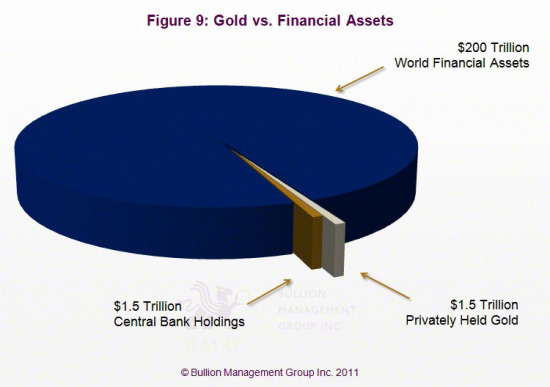 Currently there is over $200 trillion in world financial assets, and about $3 trillion in gold bullion. Most of that is privately held or held by central banks, and these major holders are highly unlikely to sell at any price. Much of what has been discussed about gold applies to silver as well as platinum, but all three metals have their own unique properties and all have resumed a position as money. Silver is money, but it is also an irreplaceable industrial metal and, unlike gold, silver is used up in the many processes for which it is essential. Silver’s industrial applications are growing on a daily basis in order to keep pace with rapid developments in technology. Geologically, silver occurs in larger quantities than gold, and is therefore easier to mine: it remains where it is formed, whereas gold travels through water and seeps into deep veins.Silver also has a lower melting point than gold and is easier to refine. These are two reasonswhy silver has always been less valuable than gold; however, silver shortages are becoming greater than gold shortages because of a number of unique conditions it faces today. In 1980, even with the silver price at a historical high, 4 billion ounces of above-ground silver existed. Today, because of silver’s dual role, only 1 billion ounces exist. Silver, like gold, is a monetary metal and a safe haven, and it cannot be debased like modern fiat paper and electronic currencies. Throughout history, silver has been used as money in more regions and countries than gold. Like gold, silver meets the criteria for universal money: it can be easily divided into equal parts, it is found worldwide and it is extremely durable. In times of extreme economic crisis, silver is more functional as money than gold, because its lower value makes it more practical as a medium of exchange. Silver remains historically undervalued, even more so than gold. In 1980, when record amounts of silver were stockpiled, the gold:silver ratio was 16:1. Currently the ratio is fluctuating between 30 and 55. At a 16:1 ratio, silver today would be $93 an ounce when compared to the price of gold. One of silver’s most unique features is its disproportionately large short position on the COMEX that has yet to be covered. Although “commercial traders” in most markets are commercial producers who wish to guarantee a fixed price for their corn or their copper, in the precious metals markets, bullion banks hold the largest short positions. Currently, the COMEX short position of the eight largest traders represents one-third of the total one billion ounces of above-ground silver bullion in existence. 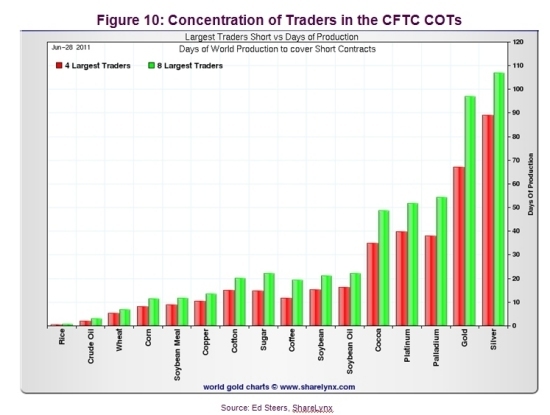 Figure 10 shows the amount of silver short positions held by the four largest traders, andcompares the days of production it would take to cover this short with other commodities. Silver has industrial uses that no other material can replace. It is malleable and ductile, and is capable of being formed into fine jewellery, hammered into thin sheets and extruded into microscopically thin wires. It is a superior conductor of heat and electricity. It is highly reflective, which is why it is used in mirrors. It also has anti-microbial properties that make it ideal for surgical applications, and as an additive to everything from paint to clothing. Because of its dual role, silver has never faced greater demand than it does today. In 2010, total fabrication demand grew by 12.8 percent to a 10-year high of 878 million ounces, anduse in industrial applications grew by 20.7 percent to 487.4 million ounces. Compared with gold, we see the consequences of silver’s industrial use. From the beginning of recorded history, 2 billion ounces of the 5 billion ounces of gold mined remain in bullion form today. 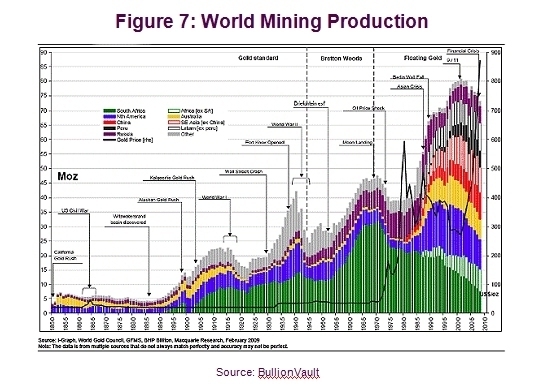 Only 1 billion of the 45 billion ounces of silver mined are currently in bullion. Assilver’s industrial role is more important than gold’s, a silver shortage would have more negative implications than a gold shortage. Although silver mine supply rose by 2.5 percent to 735 million ounces in 2010, the yearly amount of mined silver has been less than its demand for the last 15 years. There are very few pure silver producers; most silver is mined as a by-product of other metals. This could be problematic in the event of an economic slowdown. Currently Mexico leads the world in silverproduction, followed by Peru. Including all three precious metals in an investment portfolio provides greater diversification within the precious metal asset group, and offers reduced volatility as each metal has unique economic properties. 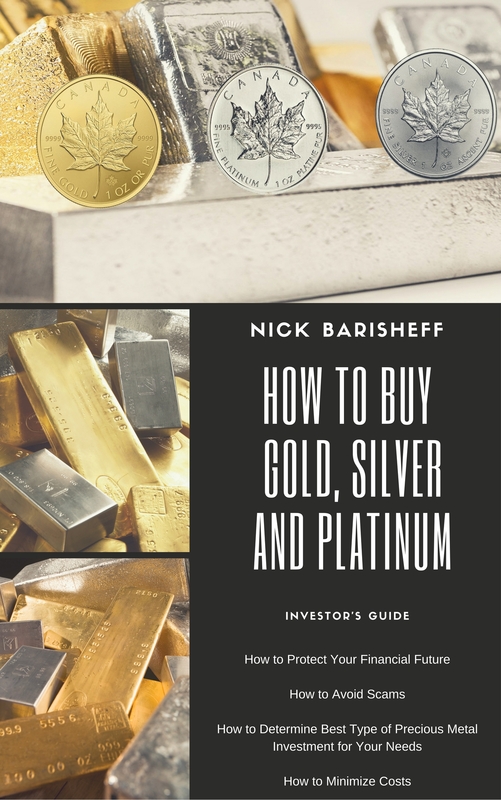 In the bull market of the late 1970s, platinum matched the gains of both gold and silver, which suggests that platinum was acting as a monetary asset during this inflationary period/dollar crisis. Although platinum coins were used in Russia in the nineteenth century, the scarcity of platinum, combined with its much higher cost of production, make it a poor choice for this purpose. It has served as a store of economic value for 300 years, however. Platinum is the rarest of the precious metals and its price reflects this. It takes approximately 10 tonnes of ore and six months of mining to produce a single ounce of platinum. Platinum is 30 times rarer than gold. Unlike gold and silver, which are mined in almost all areas of the world, most of the world’s platinum comes from only two countries—Russia and South Africa. All the platinum ever mined would occupy as space of approximately 25 cubic feet. Even though platinum hit a record high of $2,252 per ounce in 2008, it still has some distance to go to reach its inflation-adjusted high of $2,630. Since demand for platinum applications keeps growing while mine supply remains relatively fixed, the price of platinum is likely to continue rising. Since 1997, demand for platinum has exceeded mine production and global platinum demand continues to grow to record highs. Unlike gold, there are no large above-ground supplies of platinum. Currently, South Africa accounts for 80 percent of the world’s annual production of platinum and contains 88 percent of the world’s platinum reserves. This is one reason why platinum prices can be more volatile than either gold or silver prices – they are especially sensitive to political unrest in South Africa. Platinum has far more industrial uses than gold or silver. Unlike gold, over 50 percent of theplatinum produced is consumed (destroyed) in industrial applications. Platinum is indispensable for many industrial uses, such as catalytic converters in diesel engines. As the oil price increases, demand for diesel engines increases, and so does demand for platinum. According to a study by Wainwright Economics, a Boston-based investment research andstrategy firm, platinum is the leading indicator of inflation. While gold and silver lead inflation by 12 months, platinum leads by 16 months. This was confirmed in the current bull market; the rise in platinum prices started in 1999, while gold and silver’s rise began in 2001.